Yoji Kuri - Our International Honorary President ! What is Animation? What is Animation? In the 1960s, when ‘manga film’ was the only term for animated imagery in Japan, the Animation Group of Three (Hiroshi Manabe, Ryohei Yanagihara, and myself) was established and many animation screenings were held. This initiative drew great attention, bringing together various creatives active on the front lines at that time, including many cartoonists, artist painters, illustrators, photographers, and sculptors. What is the attraction of animation? After the time of ‘manga film’, people started to realize that everything could be animated, and interest toward animation began to spread. At the time when the Japanese animation industry was not yet exchanging internationally, my work Human Zoo was awarded a Special Jury Prize at the Annecy International Animation Festival, the first for a Japanese animation, which led to the Annecy Festival becoming more widely known in Japan. Since then, many Japanese animators have taken part in film festivals abroad. We longed so much for the realization of an animation festival in Japan. 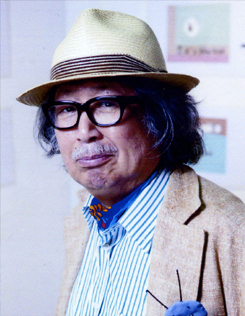 In 1985, the then-Mayor of Hiroshima, who was dedicated to international cultural projects, was persuaded by Renzo and Sayoko Kinoshita to organize the first Hiroshima International Animation Festival. Of course, I also participated in the festival and showed my work 11PM to the mayor, asking for their further understanding. From the very first, to this year’s seventeenth Hiroshima International Animation Festival, it has seen great success and growth, having been highly recognized internationally. I truly hope that this festival continues for a long time to come. 1928 Born in Sabae City of Fukui Prefecture. 1956 Graduated from the Art Department of Bunka Gakuin. 1958 Received the Fourth Bungei Shunju Cartoon Award, and a Special Prize at Nika Exhibition. 1960 Formed "Animation Group of Three" together with Hiroshi Manabe and Ryohei Yanagihara, and held the first Sogetsu Animation Screenings in Tokyo. 1962 Animation short "Human Zoo" won the Special Jury Prize at the Annecy International Animation Festival. 1963 Animation short "Human Zoo" won the Lion of San Marco Prize at the Venice Film Festival. Animation short "LOVE" won the Lion of San Marco Prize at the Venice Film Festival. 1964 Animation short "LOVE" won the Grand Prize at the International Short Film Festival Oberhausen, Germany and the Golden Dragon at the Krakow Film Festival, Poland. Animation short "The Button" won the Special Prize at the Locarno International Film Festival, Switzerland. Went on making new animation shorts "Mini Mini Animation" every week for the TV program "11 PM" presented by Nippon Television Network Corporation for 18 years. 1965 Jury at the Annecy International Animation Festival, France. Animation short "FLOWER" won the Second Prize at the Montreal World Film Festival, Canada. Animation short "AOS" won the Grand Prize at the International Short Film Festival Oberhausen, Germany. Animation short "The Room" won the Lion of San Marco Prize at the Venice Film Festival. Animation short "What Do You Think?" won the Special Jury Prize at Tours Film Festival, France. 1967 Animation short "Au Fou!" won the Grand Prize at the International Short Film Festival Oberhausen, Germany, and also won the Grand Prize at the Chicago International Film Festival. 1969 Received a Special Prize at Barcelona International Film Festival, Spain. 1973 Animation short "The Midnight Parasites" won the Silver Award at the International Short Film Festival Oberhausen, Germany. 1974 "Animation films by Yoji Kuri" won the Southern Cross Award at the Adelaide Film Festival, Australia. 1977 Animation short "MANGA" won the Bronze Dragon at Krakow Film Festival. 1982 Received the Medal with Dark Blue Ribbon. 1988 Exhibition "Yoji Kuri･Space Collage Exhibition" at Musee d' Art Moderne de la Ville de Paris. 1992 Received the Medal with Purple Ribbon. 1993 Jury at the Annecy International Animation Festival, France. Awarded the ASIFA Prize for years of contribution to the art of animation. Held many one-man exhibitions of his paintings at various art galleries and museums. 1994 Exhibition "Human Beings of Eros and Humor" at Ikeda Museum of 20th Century Art. 1995 Exhibition "The World of Yoji Kuri" in Sabae city, Fukui, Japan. 1998 Retrospective of Yoji Kuri and One-man Exhibition at Stuttgart, Germany. 2006 Received the 2nd Award of Merit at Tokyo International Anime Fair 2006. 2011 Received The Order of the Rising Sun. 2012 Received Lifetime Achievement Award at the Zagreb International Animation Festival. 2017 “Crazy Manga” won Grand Prize of Japan Cartoonists Association Award. Received Fukui Shimbun Bunka Sho (Fukui Newspaper Prize for Culture).